What’s it going to cost for a new high school and DPW facility? Our town leaders are currently having a difficult time trying to meet the budget request from the School Committee for “level services” in our schools as well as maintaining other town services. Front and center on the town’s longer term agenda are requests by the School Committee to build a new high school (estimated to cost $90-100 million) and after listening to this month’s town wide facilities review, a new DPW facility is likely to be needed in the very near future. As I have stated in an earlier blog note, next year could be a year for another Proposition 2½ override in order to meet the town’s budgetary needs if we do not spend our money wisely and use a financial plan with least a 3-5 year timeframe. It’s no secret that the Select Board and the School Committee for many years have not budgeted maintenance at a level that is prudent to avoid infrastructure deterioration so there are likely to be other major unplanned infrastructure repairs. For example, at last week’s Select Board meeting, there was discussion of a major storm drainage problem at Woodside Drive/ Williams Street that may require the expenditure of $850,000 to fix it. The Longmeadow Capital Planning committee led by Mark Gold does a great job prioritizing the town’s capital needs and making recommendations to the Select Board and Town Meeting as to which major items should be approved. However, because available monies for capital spending are limited, many needed expenditures are deferred. Now we are told that we desperately need a new high school and DPW facility. How is the town going to handle this financial burden? I’ve heard the price tags on these facilities but I was interested in what it is going to cost my wife and I as taxpayers in this town…. so I took time to do some simple financial calculations and what I found was not unexpected. Here are my simple calculations…. 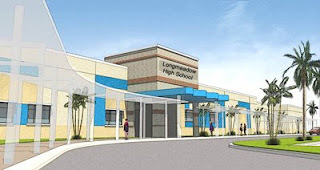 Longmeadow decides to build a new high school (estimated cost ~$100 million) and a new DPW facility ($15 million). Also assuming 60% reimbursement from the state for the school project ---> total new debt --> $55M. Using a simple mortgage financial calculator ---> annual interest + principal payments --> ~ $4.2M / year. For this proposal to succeed the town would have to pass a Prop 2½ debt exclusion override. Once the project was underway and the full monies were bonded and spent, Longmeadow property owners could see a step increase in their property taxes. For this example if one assumes that this happened in the coming fiscal year, this step increase would be by ~ 11.4% ($4.2M/$37.0M). Note: $37.0M is the total property tax levy in proposed FY09 budget. If one included the additional 2½% tax increase (.025 x $37.0M = $0.93M) the first year of the full impact could potentially see an increase of $4.2M + $0.93M (Prop 2½ limit) = $5.1M or 13.8%. For the average taxpayer paying $6000/ year, the increase would be ~ $830. Over 20 years of the bond this increase would amount to $16,600 for the average property owner. The purpose of this blog note is not to say we shouldn’t go forward with these two projects but for the town to consider using a longer range financial roadmap wherein both our annual operating costs and our future capital expenditures are more fully considered together. Last year's Budget Strategies Committee was a good start, but much more is needed. We cannot continue to simply operate from year-to-year without such a vision.